The test pressing was made after the Nirvana catalog was transferred from Original Recordings Group to ORG Music, which seems to have been formed in late 2010. This is the third test pressing on any of the ORG labels, or the first ORG Music pressing. It is the first pressing to actually be manufactured and released, after the first test pressing had an error on side A, and a retail pressing of the second test pressing was delayed most likely due to the Nirvana catalog being transferred from ORG to ORG Music. 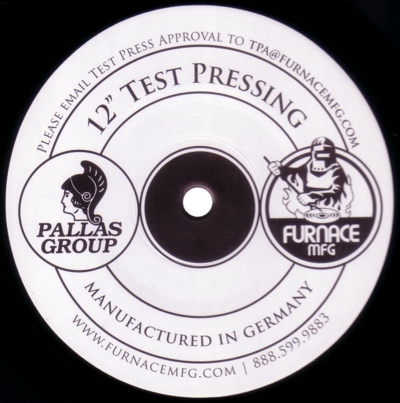 The same mother plates processed by Record Technology Incorporated (RTI)  for the previous test pressing were used, so up until that point the manufacturing history is identical. Some additions were made to the matrix codes before making new stampers. ORG Music was formed some time in late 2010, and they replaced RTI with Furnace MFG for their vinyl orders . Furnace subcontracted the production to Pallas Group in Germany. This partnership is referred to as Pallas USA. The original pair of mothers, or a new pair made from the original pair of fathers, was then sent to Pallas. Pallas stamped their internal job number, "21942", and "P. USA" onto the mother plates. The new catalog number, "ORGM-1005-A/B", was also handwritten onto the mother plates. The previous three Nirvana records were also transferred to ORG Music, but additional catalog numbers were not added to the new pressings. They already existed with ORG catalog numbers and new catalog numbers were not necessary, but Incesticide never officially existed as ORG 060. According to an eBay seller who sold multiple sets of Pallas test pressings, ORG Music sent several to the music press for promotion.